Doctor Who alums David Tennant and Catherine Tate will rekindle their bantering chemistry as one of Shakespeare's most famous couples. 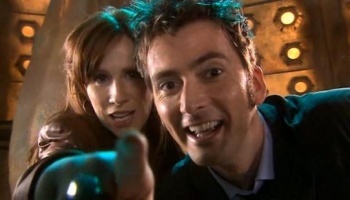 Season Four of Doctor Who saw David Tennant and Catherine Tate traipsing about the universe as the tenth incarnation of the Doctor and his companion, Donna. Now, the actors are joining forces to bring another bastion of British culture to life: Shakespeare. Tennant and Tate will star as Beatrice and Benedick in a new production of Much Ado About Nothing, opening this June in London's West End. Tennant and Tate broke the news in an interview with the BBC (that can be viewed here). In between talking about their past projects and their expectations for the production, complimenting one another, and generally palling around, the duo revealed that they had once "been DJs together... as in on the radio." Can I set the tuner in my car to that dial, please? Both actors have performed with the National Theatre and the Royal Shakespeare Company; in speaking with the BBC, Tennant noted that theatre "feels like my proper job." Since leaving Doctor Who, Tate has appeared in Gulliver's Travels, while Tennant has leant his voice to the animated How To Train Your Dragon. Much Ado About Nothing will run at West End's Wyndham Theatre from June 1 to September 3.